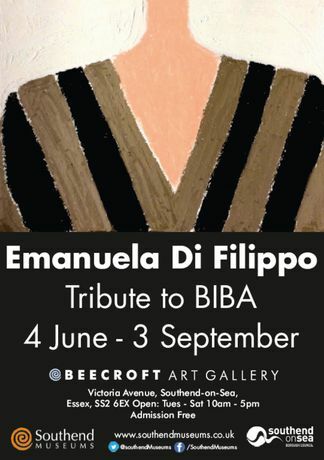 This exhibition of fashion illustration by Emanuela Di Filippo is based on Barbara Hulanicki’s distinct BIBA designs. I use different types of media such as drawing, painting and various materials to investigate and explore new systems of the language of art. “Untitled” is my last series of a hundred oil pastels on paper. In this exhibition there are on show twenty pastels on paper of different sizes. A brief colourful summary of my artistic research but above all a tribute to Biba. “Tight cut skinny sleeves, earthy colours”, “Called “Auntie Colours” - Blackish mulberries, bluberries, rusts and plums. Hulanicki described them as “looking like a funeral”. I was inspired by the shapes of Italian fashion clothing and work uniforms and the brightness of the colours of British clothing. The simplicity of the shapes playing with primary colours, secondary and complementary. The human body, male or female, that communicates emotions through different clothing. I would like to link art to fashion. Since I started my artistic research more than ten years ago I have never painted directly from nature or from photographs but I have always tried to interpret the real visions according to colours, lines and forms.